Preheat oven to 200°C (or 180°C for fan forced). Spray baking tray with cooking oil. Cut pastry into 12 small squares. Place on tray and bake for 10-12 minutes until golden brown - Cool. 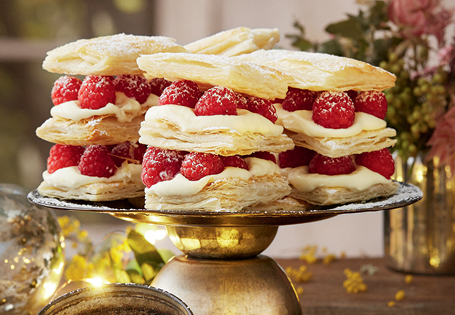 To assemble: Place a layer of mascarpone on a piece of pastry. Top with berries and grated chocolate. Flatten next piece of pastry and place on top. Repeat layering. Place a final piece of pastry on top and sprinkle with icing sugar.